In today’s passage, we continue in Jeremiah’s pronouncement of Egypt’s impending doom. It seems that throughout the history of Egypt, the Egyptians had always seen themselves as the super power of the world—towering over other nations as they showed their might in various ways. This was their national identity. 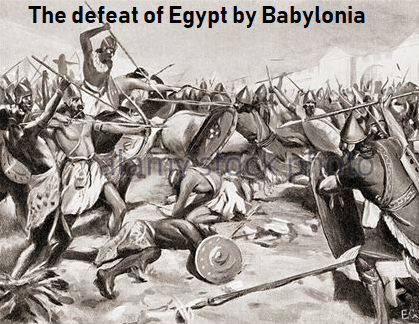 However, Jeremiah declares that another empire will come and tower over them, eventually bringing them into exile—this nation we come to know as Babylonia that took the place of Egypt as the most powerful empire in the world. It seems that no matter how powerful you are, it is only a matter of time before someone bigger towers over you. Many of us build our identity on being the best (or simply really good) at something, whether it’s career success, the amount of money we have, or the skills we possess. For this reason, our sense of value and worth is directly tied to these things. And this leads to two destructive paths. If, on the one hand, we really are the wealthiest or the most skilled, it will likely lead to pride. We will see ourselves as better than others who are not as successful or wealthy. But, on the other hand, if we fail or if someone is more successful than we are (and there will always be someone who is better or more successful than you), our self-worth is crushed. We no longer feel significant and this is very fragile ground to stand on. Our sense of identity will fluctuate depending on these unstable factors. The gospel provides the firm foundation upon which we must build our identity. We find value not in what we’ve accomplished or the skills we possess but in what Christ Jesus has done for us on the cross. And this is unshakable ground. When we succeed, we are not puffed up with conceit but rather humbled knowing that we are sinners who have been saved by grace—that even the skills and circumstances necessary for success were not due to our own doing but simply a manifestation of God’s mercy in our lives. And even when we fail, we know that we are still loved and valued by the Father because of Christ’s righteousness imputed on us and not our own. Let us build our identity on the gospel of Jesus Christ, who is our firm foundation! Prayer: Father, it is so easy to find my identity and value in my performance and success. Instead, help me to build my identity on the firm foundation of the gospel. Help me to not only know the gospel in my mind, but for my heart to fully embrace the truths of the gospel into the depths of my identity. Read Colossians 3:1-3: If then you have been raised with Christ, seek the things that are above, where Christ is, seated at the right hand of God. 2 Set your minds on things that are above, not on things that are on earth. 3 For you have died, and your life is hidden with Christ in God. What is Paul’s main command in this passage? In what ways have you set your mind on things below? Paul wants them to seek and set their minds on the things above. This is because anyone who truly believes the gospel has died to their own self, and has been raised with Christ into a new identity, a new self. Since we have been saved and raised with Christ, we ought to deliberately commit ourselves to the values of the kingdom of God and then live out those values, including how we see ourselves. We have been called to put off our own (i.e., old) self, where our identity was built on things of this world leading to much sin. We are to put on our new self by living out our newly given identity we have found in the gospel. Take some time before going to bed reflecting on the base upon which you have built your identity. How do you find value, significance and worth? Ask God to help you to find your identity in Christ alone!